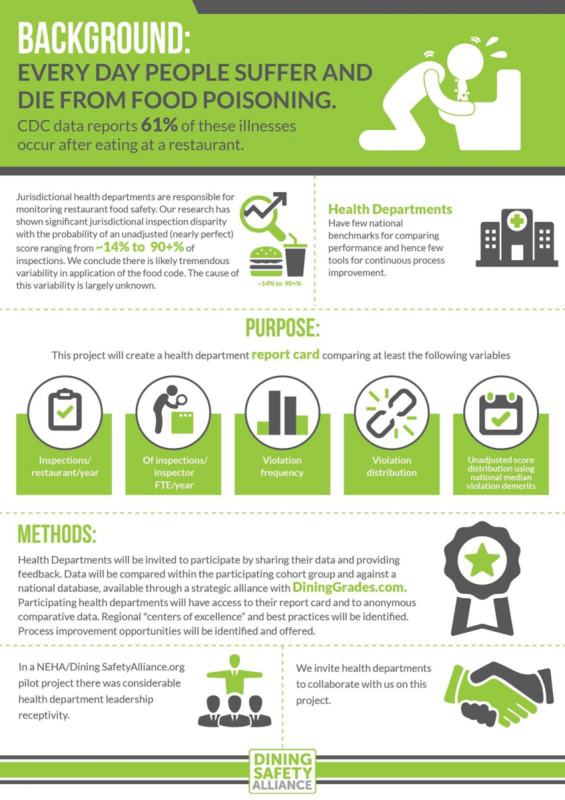 NEHA is excited to announce a new project studying the variance in restaurant inspection scores. Food safety in restaurants is a popular topic discussed among environmental health food safety experts. To learn more about this project, opportunities for collaboration and involvement from health departments, we invite you to explore our page. Kaylan Celestin is a Public Health Associate for the Centers for Disease Control. She is assigned to work at the National Environmental Health Association. Kaylan is working with Dr. Harlan Stueven, executive director and founder of Dining Safety Alliance. NEHA has a partnership with Dining Safety Alliance to study the variance in restaurant inspection scores. NEHA's partnering with Dining Safety Alliance to understand where and why there is variation in restaurant inspection scores across jurisdictions. There are partner organizations working in this topic area as well, including, City Health and University of Minnesota School of Public Health. Disclaimer: NEHA recognizes that restaurant grading isn't necessarily utilized across the U.S. Yet. it is reported that Restaurants in the United States are regularly inspected by health departments, but few data exist regarding the effect of restaurant inspections on food safety (1). By studying the variance in restaurant inspection scores across jurisdictions, it will unveil the need for uniformity and awareness of the implications to the public's health. We are in the foundational phase of this project and are looking for your expertise. Your feedback is valuable in making this project a success! Click on image to view full sized infographic. City Health’s assessment of restaurant inspection policies. Food Safety News: Letter grades for restaurants helped reduce Salmonella illnesses in New York City. Please contact Kaylan Celestin, Project Specialist, if you have further questions at kcelestin@neha.org. "The phrase “it must have been something I ate” is usually said with a smile and a chuckle, but the reality is that food poisoning is a serious problem. There are tens of thousands of food borne illnesses and several thousand deaths among restaurant guests every year." "Policies requiring food establishments to publicly post safety inspection “grades” empower consumers, reduce foodborne illness rates, and cut down on health care costs."